The Virginia Lawyer Referral Service will connect you to a lawyer in your area for $35. You receive a consultation of up to a half hour with him or her – no strings attached. Call between 9:00 a.m. and 5:00 p.m., Monday through Friday. Closed on state and federal holidays. Email lawyerreferral@vsb.org. Please do not send personal information regarding your case via email. We only need your contact information. 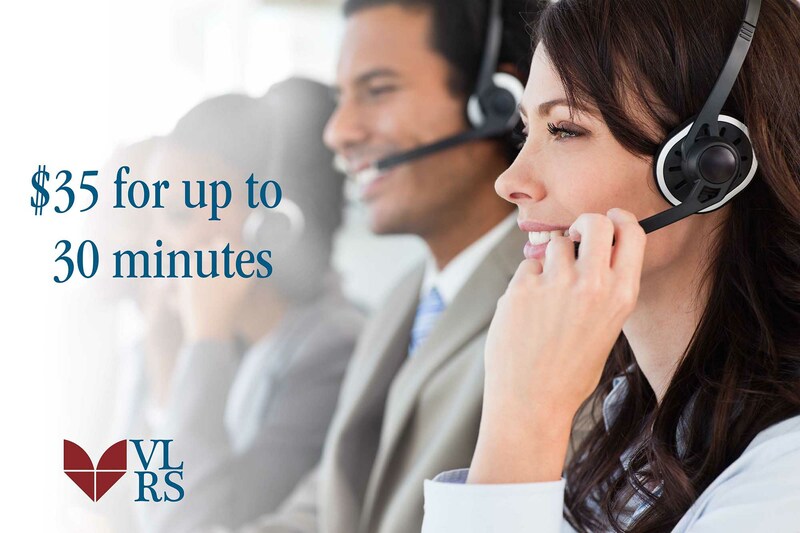 The Virginia Lawyer Referral Service is a telephone and online-only service; it does not handle walk-in customers. Learn more about the service by reading the Frequently Asked Questions. The Virginia Lawyer Referral Service (VLRS) is a service of the Virginia State Bar (VSB). The VSB website and the VLRS pages are designed to provide general information to the public and are not intended to, and do not, offer legal advice. The VSB makes no warranties or representations concerning an attorney’s ability to handle a client’s particular legal matter. The decision to employ an attorney is solely that of the client, subject to the attorney’s willingness to accept employment. There is no attorney-client relationship formed by any use of the information provided on the website, the VLRS application, or by VSB staff. If your legal problem is an emergency, you should consult an attorney immediately.